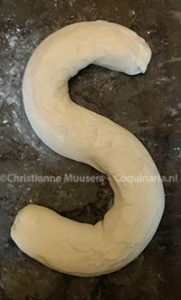 The banketletter is one of the few traditional Dutch Christmas bakes, as most Dutch December bakes are actually done for the national children’s feast Sinterklaas on December 5th. Most people just buy it in the stores, and I must admit that it takes some work to make a banketletter from scratch. But I hope people will make it themselves at least once, if only to acquire a new respect for the artisanal bakers that produce such delicious pastries. For example, my banketletter was a little flawed as at one point the dough was not sealed firmly enough and some of the stuffing leaked out during baking. In all honesty, this recipe does not need a separate page, because the two components (pastry dough and almond paste) already have their own pages on Coquinaria. All that needs to be done is to combine them. 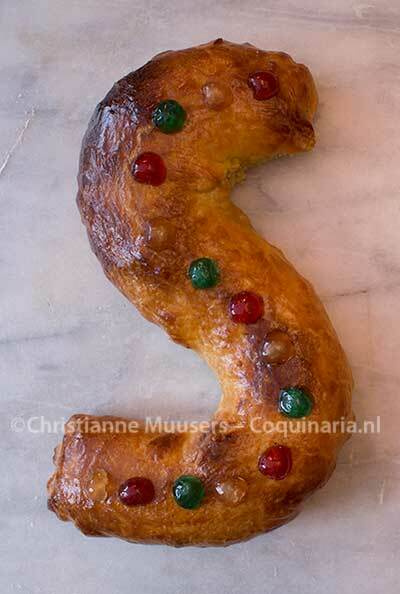 But since I made a banketletter for Sinterklaas this year, I decided to take pictures and put the recipe online. The quote in the subtitle is from a Dutch satirical sketch from the comic duo Koot & Bie from the 1980s, in which a man is being interviewed who takes part in the (non-existing) World championship Pentla-pooping (only audio – in Dutch). Sweet pastry, for about 800 gram (1⅔ pound); preparation in advance 15 minutes; preparation 30 minutes. Roll out the dough into a thin, oblong sheet. Mould the almond paste into a long cylinder with a diameter of about 2.5 centimetre/1 inch. Place the almond paste on the sheet of dough and wrap the dough around it. Moisten the edges with some water and press well together. Cut away any excess dough, otherwise the crust will be too thick to bake. Place the stuffed pastry on a baking tray with the seam underneath. If another letter than ‘I’ is desired, shape the pastry carefully, taking care that the pastry will not bunch together. Snip away any excess dough if necessary. Coat the pastry with some stirred egg and put it in the refrigerator for 30 minutes. Preheat the oven to 240 °C/465 °F. Remove the pastry from the refrigerator and coat it once more with stirred egg. When using almonds for decoration, put them on the pastry before baking. Bake the pastry for about 20 minutes (depending on the thickness of the pastry and the oven). Place a bowl with water on the oven floor for an extra crispy crust. Heat the apricot jelly and strain it. Place the baked banketletter on a cake rack and coat the crust with the warm apricot jelly. Decorate with candied cherries, succade and/or candied angelica and leave to cool. The banketletter is at its best when still a little warm from the oven. But it can also be reheated in the oven. Do not use the microwave because the pastry will lose its crispiness. The Dutch eat banketletter with a cup of coffiee or tea.